After the heights of the last few days the crews might have been forgiven for thinking that things today would be all downhill. In the event this wasn’t quite the case, even though the eventual night halt was on the coast and breakfast was taken at 2400 m.
So, after a sublime rest day the rally rolled its way through the Atacama Desert due west to the Pacific and there was a long drive in the route book from San Pedro de Atacama through the Val de Luna with its signature sandstone peaks. At one point we climbed to just over 3300 m to cross the Cordon Barro Arana. Oddly, it was cool and cloudy as we began the day but this did nothing to dampen the mood of the starters at the dusty MTC near to the Vale de Luna. We were one crew short today however and will be for a couple of days at least, Gavin and Diana Henderson have flown home for a must see matinee so, Fred Gallagher has sportingly taken the wheel of their Porsche until they return, although they’ll lose their hard fought for third place. The rest day maintenance will no doubt pay dividends further down the road and, thanks to the efforts of various couriers and taxis, both Anton Gonnissen and Phillip Blunden were riding high on new tyres which they’d fitted to their Bentley and their Healey respectively. Paul Kirkham was also in full running order today thanks to Matt ‘mig welder’ Bryson and Jim Smith who sacrificed most of their rest day to reattach various parts of the rear suspension to a ‘Ford called Sheila’. The first Passage Control of the day was in Chuquicamata and the route led us past a huge opencast copper mine, the Mina de Cobre whose dust added to the already hazy morning. The first Regularity though, the Sin Nombre, came shortly afterwards and blew away any lingering atmospheric particles. 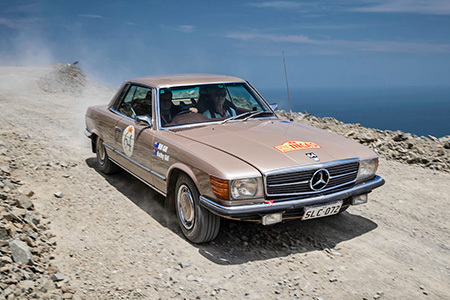 This was a short and sweet blast through the desert which began at an altitude of around 1200 m. As the route progressed though it was plain that we were dropping very quickly towards the ocean which had just appeared on the horizon. Another Passage Control at Tocopilla, right on the sea front ensured that everyone was on the right route and, in this busy little port town we turned to run almost due north up the coast to the second regularity of the day at Desvio, along a craggy unmade road clinging to the blasted rock face for 6 km. This was a challenging section but the views from the top, for those who dared to look, were well worth it. The timing point at the end of this section concluded the sport for the day and now it was a case of getting stuck into the excellent road along the coast, metres from the Pacific Ocean through tiny and seemingly deserted shanty towns such as Posada to the Time Control in El Loa where they did a mean Chicken and Avocado roll and gave Hans Middleberg time to sort out the issue with his Mustang’s starter motor. Along the Chilean Route One, the Pacific Highway we had high desert on the right of us and rolling ocean on the left. Clouds rolled and hung from the towering sandy, dune like cliffs as seals surfed alongside. 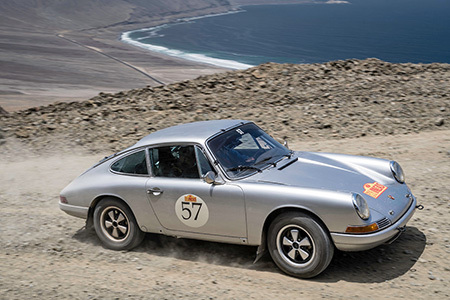 Soon enough, on a road as good as this, the night halt arrived in the seaside town of Iquique where yet more running repairs were being carried out in the carpark. Paul Carter was reattaching a wing to his Bentley with a ratchet strap before setting to with a stick welder to make the repair more permanent. Serge Berthier was looking for someone weld a split in his fuel tank. The low slung Jensen has done really well so far but it only takes one rogue rock to cause hours of frustration. We’re all breathing a little easier this evening, the oxygen rich air suits both us and the cars but it’s to be a short lived respite. We’ll be climbing again soon enough.